are 33 posts. Desirous candidates eligible for this MTS jobs have to access the Telangana official website @ www.telanganapostalcircle.in. Online registration of applications available from 09-12-2017. Last date to submit application forms is 08-01-2018. Candidates with Matriculation/ SSC or ITI passed with the age limit of 18 - 25 years are eligible to apply for this Telangana Postal MTS Notification 2018. Telangana Postal Circle Multi- Tasking Staff Jobs Recruitment selection is based on merit performance of the candidate in Aptitude Test. Full information regarding Selection Process, Application procedure, Application fee, Age limit, Exam Pattern and Syllabus for Telangana postal MTS Notification 2018 are given below. Available vacancies in Telangana Post Circle Recruitment Exam are 33 posts. Post Name: Multi- Tasking Staff: 33 posts. Pay scale for Multi- Tasking Staff Jobs is Rs. 18,000/- plus allowances. Minimum age limit is 18 years and maximum age limit is 25 years for general category as on 08-01-2018. Age relaxations for SC/ ST/ OBC/ PH/ Ex- servicemen applicable as per govt rules. Candidate must hold Matriculation/ SSC or ITI qualification from recognized board/ Institution. For detailed qualifications see the Telangana Post Circle notification. Candidates will be selected for Multi- Tasking Staff Jobs is based on their performance in Aptitude Test. Aptitude Test will comprises of 4 parts and will be held for 100 marks. Total Duration of this Exam is 120 minutes. -Part A: General Knowledge- 25 Qs- 25 marks. -Part B: Mathematics- 25 Qs-25 marks. -Part C: English Language: 25 Qs-25 marks. -Part D: Telugu Language: 25 Qs-25 marks. For OBC candidates: 09 marks. 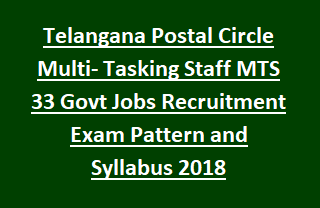 Eligible Applicants have to go through the official website www.telanganapostalcircle.in and apply for Telangana Post Circle MTS Jobs. Read the notification clearly and finish the registration process. Using this Registration number log on to the Telangana Postal website. Submit the applications for MTS posts from 09-12-2017 to 08-01-2018.